Their versatility and economy make roller brushes from HK - KOTI the ideal choice for wide-ranging different fields of production and industrial products. They are a particularly cost-effective solution for brushing tasks not requiring very high rotational speeds and where there are no high mechanical loads acting on the brush. It goes without saying that we make no compromises when it comes to quality and efficiency. More detailed information is available on request. Roller brushes with plastic cores are defined as having a core length of 100 mm or more. In this case, HK demonstrates its broad approach in the range of sizes, core materials and bristle types it offers. 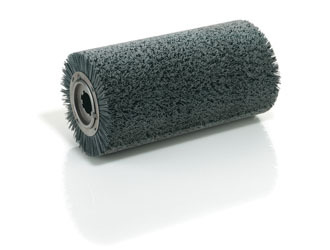 Roller brushes with tubular steel cores are defined as having a core length of 100 mm or more. The basic core, consisting of steel or stainless steel (1.4301, 1.4541) considerably improves the strength of the brushes. The bristles are secured in a steel strip mount which is attached to the roller core in the form of a coil.